Although Pluto was discovered in 1930, limited information on the distant planet delayed a realistic understanding of its characteristics. Today Pluto remains the only planet that has not been visited by a spacecraft, yet an increasing amount of information is unfolding about this peculiar planet. The uniqueness of Pluto's orbit, rotational relationship with its satellite, spin axis, and light variations all give the planet a certain appeal. Pluto is usually farther from the Sun than any of the nine planets; however, due to the eccentricity of its orbit, it is closer than Neptune for 20 years out of its 249 year orbit. Pluto crossed Neptune's orbit January 21, 1979, made its closest approach September 5, 1989, and will remain within the orbit of Neptune until February 11, 1999. This will not occur again until September 2226. As Pluto approaches perihelion it reaches its maximum distance from the ecliptic due to its 17-degree inclination. Thus, it is far above or below the plane of Neptune's orbit. Under these conditions, Pluto and Neptune will not collide and do not approach closer than 18 A.U. to one another. Pluto's rotation period is 6.387 days, the same as its satellite Charon. Although it is common for a satellite to travel in a synchronous orbit with its planet, Pluto is the only planet to rotate synchronously with the orbit of its satellite. Thus being tidally locked, Pluto and Charon continuously face each other as they travel through space. Unlike most planets, but similar to Uranus, Pluto rotates with its poles almost in its orbital plane. Pluto's rotational axis is tipped 122 degrees. When Pluto was first discovered, its relatively bright south polar region was the view seen from the Earth. Pluto appeared to grow dim as our viewpoint gradually shifted from nearly pole-on in 1954 to nearly equator-on in 1973. Pluto's equator is now the view seen from Earth. During the period from 1985 through 1990, Earth was aligned with the orbit of Charon around Pluto such that an eclipse could be observed every Pluto day. This provided opportunity to collect significant data which led to albedo maps defining surface reflectivity, and to the first accurate determination of the sizes of Pluto and Charon, including all the numbers that could be calculated therefrom. The first eclipses (mutual events) began blocking the north polar region. Later eclipses blocked the equatorial region, and final eclipses blocked Pluto's south polar region. By carefully measuring the brightness over time, it was possible to determine surface features. It was found that Pluto has a highly reflective south polar cap, a dimmer north polar cap, and both bright and dark features in the equatorial region. Pluto's geometric albedo is 0.49 to 0.66, which is much brighter than Charon. Charon's albedo ranges from 0.36 to 0.39. The eclipses lasted as much as four hours and by carefully timing their beginning and ending, measurements for their diameters were taken. The diameters can also be measured directly to within about 1 percent by more recent images provided by the Hubble Space Telescope. These images resolve the objects to clearly show two separate disks. The improved optics allow us to measure Pluto's diameter as 2,274 kilometers (1413 miles) and Charon's diameter as 1,172 kilometers (728 miles), just over half the size of Pluto. Their average separation is 19,640 km (12,200 miles). That's roughly eight Pluto diameters. Average separation and orbital period are used to calculate Pluto and Charon's masses. Pluto's mass is about 6.4 x 10-9 solar masses. This is close to 7 (was 12 x's) times the mass of Charon and approximately 0.0021 Earth mass, or a fifth of our moon. Pluto's average density lies between 1.8 and 2.1 grams per cubic centimeter. It is concluded that Pluto is 50% to 75% rock mixed with ices. Charon's density is 1.2 to 1.3 g/cm3, indicating it contains little rock. The differences in density tell us that Pluto and Charon formed independently, although Charon's numbers derived from HST data are still being challenged by ground based observations. Pluto and Charon's origin remains in the realm of theory. Pluto's icy surface is 98% nitrogen (N2). Methane (CH4) and traces of carbon monoxide (CO) are also present. The solid methane indicates that Pluto is colder than 70 Kelvin. Pluto's temperature varies widely during the course of its orbit since Pluto can be as close to the sun as 30 AU and as far away as 50 AU. There is a thin atmosphere that freezes and falls to the surface as the planet moves away from the Sun. NASA plans to launch a spacecraft, the Pluto Express, in 2001 that will allow scientists to study the planet before its atmosphere freezes. The atmospheric pressure deduced for Pluto's surface is 1/100,000 that of Earth's surface pressure. Pluto was officially labeled the ninth planet by the International Astronomical Union in 1930 and named for the Roman god of the underworld. It was the first and only planet to be discovered by an American, Clyde W. Tombaugh. The path toward its discovery is credited to Percival Lowell who founded the Lowell Observatory in Flagstaff, Arizona and funded three separate searches for "Planet X." Lowell made numerous unsuccessful calculations to find it, believing it could be detected from the effect it would have on Neptune's orbit. Dr. Vesto Slipher, the observatory director, hired Clyde Tombaugh for the third search and Clyde took sets of photographs of the plane of the solar system (ecliptic) one to two weeks apart and looked for anything that shifted against the backdrop of stars. This systematic approach was successful and Pluto was discovered by this young (born 4 Feb 1906) 24 year old Kansas lab assistant on February 18, 1930. Pluto is actually too small to be the "Planet X" Percival Lowell had hoped to find. Pluto's was a serendipitous discovery. Pluto, Charon, and USA Size Comparison. This is the clearest view yet of the distant planet Pluto and its moon, Charon, as revealed by the Hubble Space Telescope (HST). The image was taken on February 21, 1994, when the planet was 4.4 billion kilometers (2.7 billion miles) from the Earth. 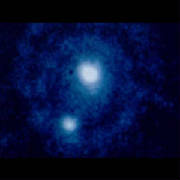 The HST corrected optics show the two objects as clearly separate and sharp disks. This now allows astronomers to measure directly (to within about 1 percent) Pluto's diameter of 2,320 kilometers (1,440 miles) and Charon's diameter of 1,270 kilometers (790 miles). The never-before-seen surface of the distant planet Pluto is resolved in these NASA Hubble Space Telescope pictures. These images, which were made in blue light, show that Pluto is an unusually complex object, with more large-scale contrast than any planet, except Earth. Pluto probably shows even more contrast and perhaps sharper boundaries between light and dark areas than is shown here, but Hubble's resolution (just like early telescopic views of Mars) tends to blur edges and blend together small features sitting inside larger ones. This is the first image-based surface map of the solar system's most remote planet, Pluto. The map, which covers 85% of the planet's surface, confirms that Pluto has a dark equatorial belt and bright polar caps, as inferred from ground-based light curves obtained during the mutual eclipses that occurred between Pluto and its satellite Charon in the late 1980s. The brightness variations in this map may be due to topographic features such as basins and fresh impact craters. However, most of the surface features are likely produced by the complex distribution of frosts that migrate across Pluto's surface with its orbital and seasonal cycles and chemical byproducts deposited out of Pluto's nitrogen-methane atmosphere. Names may later be proposed for some of the larger regions. This image shows a comparison between a ground based view (left) and a Hubble Space Telescope view (right) of Pluto and Charon.